After trying some more versions of this stitch, I finally decided to let go of this sampler. 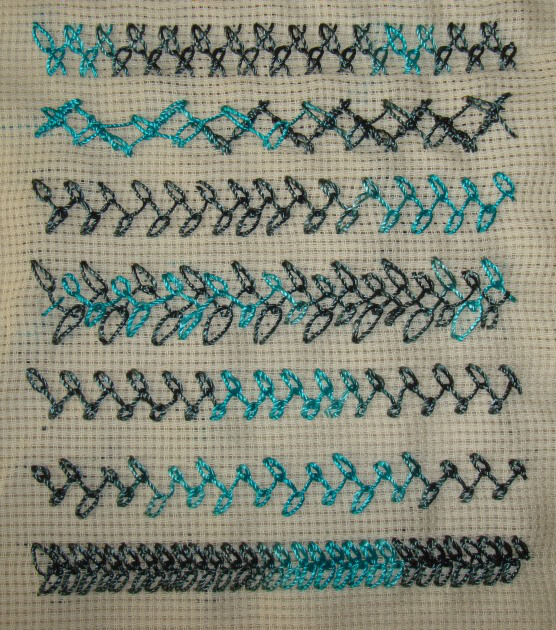 I tried the version on A-Z of embroidery book in this part of the sampler. before trying that, I worked the first sample, by starting the chain stitches a little behind the straight stitches. This looks like two rows of chained cross stitch. Then, wanting to be adventurous, I tried this stitch with rope stitch, realized this cannot be done, so worked a row of zigzag rope stitch, this being a feathered chain stitch sampler, worked a row of this stitch over zigzag rope stitch, thus covering up in the second sample. From the third sample this stitch is worked in the version found in the book. The fourth sample is one row worked over the other in this version. 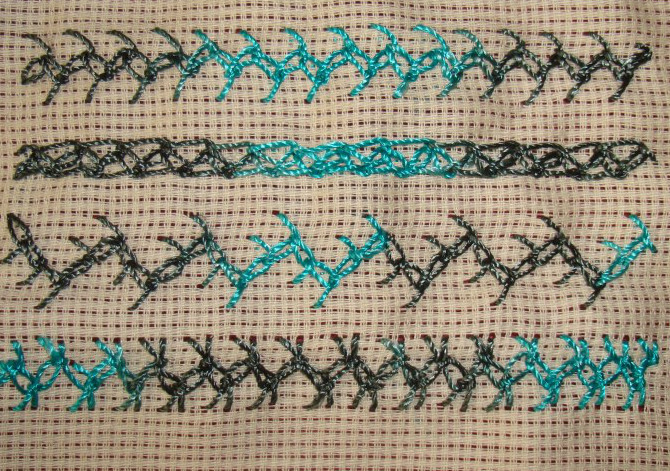 The chain stitches in the bottom are smaller in the fifth row, the small and long chains are alternated in the sixth row. In the seventh row, I started by working the straight stitches very short, and ended up with this sample! very interesting! In these samples, after working the chain, instead of working a straight stitch, a buttonhole stitch or cretan stitch was done. By doing this I was able to work a feathered chain stitch lookalike in the first row. In the second row, it was closed feathered chain stitch lookalike. Next row, is two step feathered chain ditto. I might as well try the up and down feathered chain in the last row. Actually we have tried this version as chained buttonhole stitch , I think. These explorations are with two rows of feathered chain stitches worked together. I tried working two rows together in four ways. 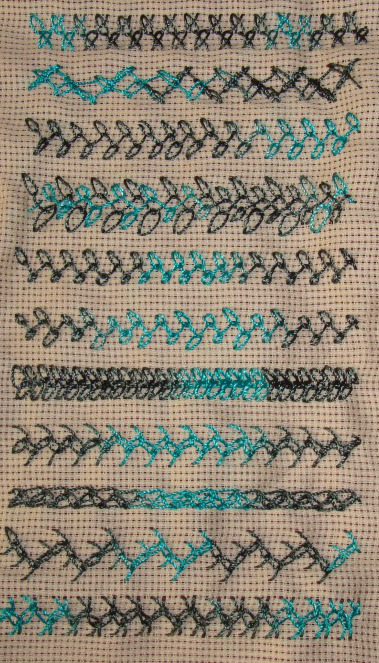 In the second, fourth and the sixth rows, the stitches are worked in the opposite directions from the top rows. The position of the chain and tails stitches vary accordingly. The third row if worked closely will look like new stitch. This stitch is worked over previous row of feathered chain in a different colour. This idea I copied from Queenie, she did this with another stitch on her blog. This stitch is long tailed chain stitch worked in zigzag manner, which gives an effect of feather stitch. 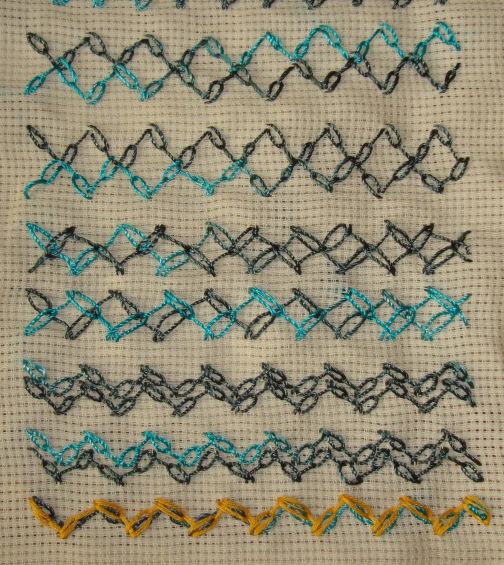 The working of this stitch is on SharonB ’s blog. 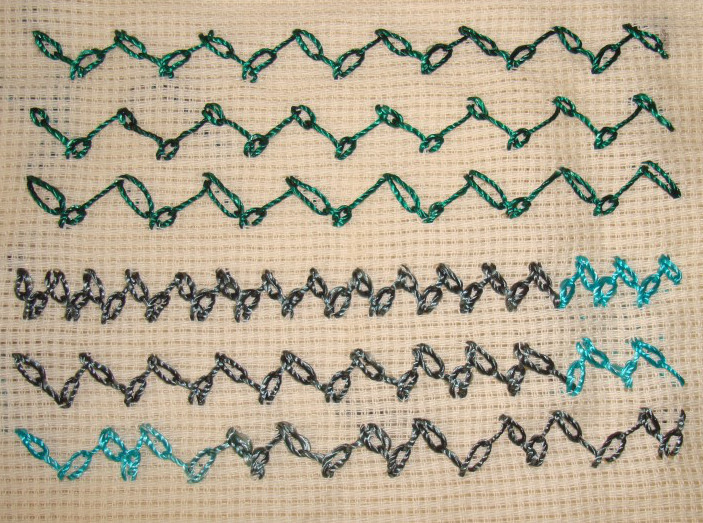 After working the version on Sharon’s blog in the first row, the chain lengths are varied on the second and third rows. The stitches are worked closely in the fourth row. The closed and open version are alternated in two ways in the fifth and sixth rows.